“Why War?” was the title of an interchange of letters between Sigmund Freud and Albert Einstein, starting with Einstein’s letter to Freud dated “Caputh near Potsdam 30 July 1932“, answered by Freud from “Wien September 1932” (Why War- Freud). Soon 85 years ago. What can we still learn from these giants, and what might they have learned in the meantime? It is very easy to sit in judgment of a world war, a cold war and much else later; therefore that is not what we are going to do. Rather, let us look at their approaches, as fellow human beings searching for answers to a question for humankind at all times: the curse of war. It is a remarkable document, and highly recommended reading. Sadly enough, there is even a certain freshness to it as official thinking has not progressed much beyond what they had to offer. Einstein comes out as a realistic lawyer; Freud as a theoretical social scientist and macro-historian. For Einstein this may have something to do with the double meaning of “law”: descriptive of reality and prescriptive for reality, discovering the former and imposing the latter. Freud’s world is more abstract and chaotic. There are two indelible “instincts”, Eros and Death-Thanatos. But they combine in complex ways and are difficult to separate. We cannot just turn Eros against Thanatos, peace against war as they both want. They see themselves as pacifists, hoping for the world to join them. The simpler of the two, Einstein, states: “My first axiom /in/ the quest of international security involves the unconditional surrender by every nation of its sovereignty /to/ a legislative and judicial body to settle every conflict arising between nations”. Yet, “strong psychological factors are at work, which paralyze these efforts. Small determined groups regard warfare and the manufacture and sale of arms as occasions to advance their personal interests”. Greed. As realistically true now as then; a law in the descriptive sense. Not “uncultured masses” but “the so-called ‘intelligentsia’ is most apt to do this, with “no direct contact with life in the raw, but encounters it in its easiest synthetic form–upon the printed page”. He then turns the “dark places of human will and feeling” over to Freud, from West to West, both unconscious of that limitation. Freud has heard that “there are races whose life is passed in tranquility and know neither compulsion nor aggressiveness” and “can scarcely believe it” (see next week’s editorial on “Peaceful Societies”). Freud believes that among primitives muscular strength was what counted, but gradually intellect and reason became stronger. He sees in every society the strong trying to increase their power as force, and the weak trying to unite against them, l’union fait la force. The units where this drama unfolds become bigger, “violence is overcome by the transference of power to a larger unity that is held together by emotional ties between members, ‘identity.’ Rulers seek a dominion of violence, the oppressed equal justice for all”. Freud praises pax romana and “a peacefully united and flourishing France”, in spite of the horrors of violence that brought them there. He joins Einstein: “Wars will only be prevented with certainty if mankind unites in setting up a central authority to which the right of giving judgment upon all conflicts of interest shall be handed over–a supreme authority, and its endowment with necessary power.” “There is no use in trying to get rid of men’s aggressive inclinations”. The United Nations, and its Security Council in particular, were designed to do much of what Einstein and Freud wanted, but they hardly succeeded beyond the League of Nations. LN was unable to stop Axis power belligerence, UN is unable to stop USA-Israel belligerence; LN was as unable to abolish colonialism as the UN to abolish neo-colonialism; neither is able to stop racism–argued so strongly by Japan at the inception of the LN. If there will be more peace in the world, it will probably be more due to moral sentiments and social processes. The legal model, peace by law, dominates them to the point that they do not make “law” problematic. And Einstein seems to buy into Freud’s “instincts” as innate, inherent inclinations in humans, not making them problematic. Humans are capable of love and cooperation, of hatred and violence, as something innate, beyond doubt. Nevertheless, that something may also be carried by Freud’s culture, reinforced or weakened, collective not only individual, and since they are both concerned with collective violence. Freud’s opening for culture was a step forward. But: there are cultures and cultures. And they both fail to unpack “conflict”, making that problematic. They use it not only as another word for violence but as something to be “settled”. However, they see that as a process from above they hardly would have accepted in their own problematic marriages. Why not education, why not people learning about conflicts and their solutions? Conclusion: let nature and culture share the “instincts” as innate inclinations that cultures process; include how conflicts can be “settled” by solving incompatibilities; focus not only on how to change humans so as to reduce violence but also on how to change social and natural reality so as to accommodate solutions. Plus, include the lasting traces of the violence of the past, the traumas. The building blocks are all there. Yet more can be gained by proactive work on conflict and trauma than by reactive work on violence. This article originally appeared on Transcend Media Service (TMS) on 26 Jun 2017. Anticopyright: Editorials and articles originated on TMS may be freely reprinted, disseminated, translated and used as background material, provided an acknowledgement and link to the source, TMS: Freud-Einstein on Peace, is included. Thank you. With all due respect this kind of (implied) moral equivalence is unworthy of your and your readers intelligence. I get the provocative angle, but you end up preaching to the choir alone. JG didn’t state anything about the Palestinians, but even if this was the case, don’t you see a quite hideous comparison between the Israel-Palestinian conflict and the permediated slaughter of 6 million jews (as well as countless others) in WW2? If you don’t see the problematic moral equivalence here, I think you have one of the answers why the former conflict is so difficult to resolve. Professor Galtung gives a nice, synoptic review of the basic differences of their approaches: “Einstein comes out as a realistic lawyer.” His laws [whether of relativity or human “nature”!) are both “descriptive” and “prescriptive.” Einstein’s methodology is to observe and test [whether thru lab experiments or “Gedankens”–thought experiments]and then “prescribe.” E=MC2 is as immutable and inescapable a “law” as “strong, psychological factors” and human “greed” militating for war! 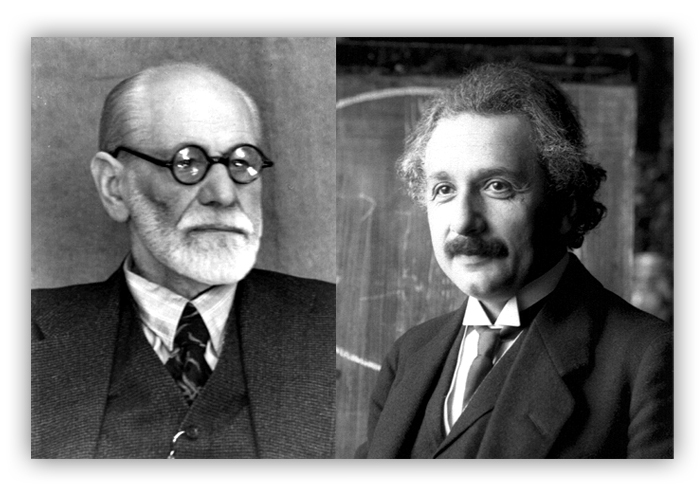 Both Freud and Einstein hope for a larger agency; a sovereign power able to unite the various, legitimate “identity claims” of contending groups under a moral law that seeks the protection and advancement of human nature–and our interlinked “natural world.” Something like the League of Nations (then) and our United Nations now. I do not see the equivalence argument being made above at all. Johan Galtung is asking 2 questions and answering them in line with historical accuracy. Did the LN prevent WWII yes or no? Did the UN prevent the unfolding colonization of Palestine which happenned as a consequence of refugees fleeing from the carnage caused by the failure of the LN? The more I think about the sentences Johan Galtung wrote, the more sad I am because of how true they are. The key point is then that peace must come from within the hearts of men. For their minds produce follies over and over again. Obviously I seem to be the only one that hold the view about the moral equivalence and coupled with other observations, among these 1) rosemerry’s cricism of my posts in general which I feel is shared by others and 2) my total opposition to the anti-vaccine agenda that also seem to be an important and recurring part of the site, I feel that I’m more an “irritant” than a contributer to the editorial line and direction. I have no reason to be seen as acting as a “saboteur” or as a sole roving “opponent” to in the Transcend community so I will respect the line and disengage from the comments. Pace and godspeed to all! But on a more serious note – a pity if you leave. Stat happy!! I shall be missing myselves. Cry me a river… :-) Godspeedy! Too bad it is in Portuguese. Do you have a translation to English? Or the text in Word instead of pdf?